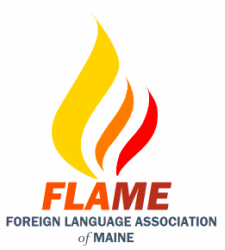 The FLAME website offers resources and information for Maine's K-12 teachers of French, German, Latin, Spanish, ESL, and other languages. The Foreign Language Association of Maine is a non-profit organization whose purpose is to promote and improve the teaching and study of languages and cultures of the world. It also strives to further the common interests of teachers, students and others for whom world languages play an important role. Link to the brochure with share presentations! Click here to see the 2018/2019 Winter Newsletter! It also includes information about the up coming conference. Gen Z at school and in the world: How do we recognize, harness and mold their unique skills? There is a new exciting contest in addition to the video contest! Instagram! Please click here to go to the Student Contest section to get more information. Click here for information about the ​Consulate of Spain Scholarship & Application. The application must be postmarked by January 21, 2019 or arrive via email 11:59 on January 21, 2019. Click here to get information about the Salamanca 2019 Program . FLAME is creating a bank of units, lessons, activities, and resources that is created by you, the teacher. This bank will be located on the World Languages in Maine: A Resource Bank. Remember there is no such thing as a perfect anything but this a way to gather and share with teachers in Maine. Please fill in this handy form. You will need to supply a link (including https://) for what you are sharing. 2. Find the folder, doc, spreadsheet etc that you would like to share. 3. Click ONCE to highlight. 5. Change to 'Share With Anyone With A Link.' This will let us get to it. 7. Paste the link you copied into the form. File Upload is not possible at this time with Google as it is a security hazard. We would recommend converting a Word or Pages files to a Google Doc or a PDF that you can put in your Google Drive to create a sharing link. Don't worry, a copy will be made and the copy will be put on the site as view only. Also, please do a separate form for each item you would like to share. Please note: it may take a few days for your materials to be put on the site. If you are expecting difficulties, email Rebecca Manchester (rmanchester@bonnyeagle.org) for help. Thank you for your time, your energy, and your dedication to the students of Maine! The NECTFL Review encourages articles of interest to instructors, researchers, and administrators at all educational levels on theory, research, and classroom practice in language teaching. Articles dealing with pedagogical strategies, materials and curriculum development, language teaching technology, the teaching of literature, assessment, community awareness projects, and international studies would be equally welcome; the foregoing list illustrates the range of concerns that might be addressed in submissions. We welcome manuscripts from teachers at all levels, pre-K through university, and from teacher educators. The journal is published twice a year-in January and in September. There is no specified deadline for submission of articles. For complete submission guidelines and/or to submit an article, please visit our website. Please make sure to look at our Bulletin Board for information about upcoming workshops, classes, and any announcements. The Bulletin Board can be found by rolling your cursor over the Announcements and Contacts Us tab at the left. Please note that the two videos (The Many Faces of Maine and The Path We Choose) that were on the Home page are now located under the Professional Development page called Videos. Based on the Maine Learning Results; ACTFL Standards for Foreign Language Learning in the 21st Century, ACTFL Proficiency Guidelines and Standards for Classical Language Learning. Please note that a (*) indicates that the standard or indicator may not be applicable to Classical Languages, depending on the instructional approach. NOTE: the term “text” as used in this document refers to written, auditory as well as visual forms of communication.